Firstly can I say that Michael Grant is probably one of the most creepy YA writers out there. The man delights in terrifying teenagers with his creepy and twisted imagination. I find myself having to read his books in the day time with extra lights on, someone else in the house, a space in the freezer to stash it if it gets too much and a pillow to hide behind. There are several times when I have to stop reading and pull myself together and am torn between not wanting to know what happens next but also needing to know what happens next. Therefore I would certainly recommend his books if you have a pretends-to-be-hard-as-nails-teenager in the family as it'll be a good test of how hard and scary they actually are. 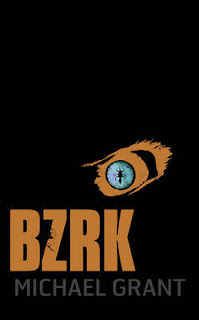 The world in BZRK is a scary place just most people don't know it. There are two rival groups who both use nano technology to fight one another as one tries to bring down world leaders and cause chaos while the other tries to stop them. The ideas behind this story are ingenious main because they could so easily be true if not now, in a few years down the line. The whole world of biots and nanos was incredibly creepy main because the ordinary person wouldn't know they were there and doing the things they did. The descriptions of them entering human bodies was downright chilling, gruesome and all too creepy for my liking throughout the entire book but quite probably something teenagers would love as it's really gory. I must say the villain of the piece in this story is really one to be scared of not just because of what they are able to do but also because of their physical form. the conjoined twins in this are downright sinister and scary throughout. Just reading your review gave me chills! Hmm, definitely interesting. You've caught my attention now; I think I'm going to have to add this book to my wishlist! Great review! I love Michael Grant's Gone books so I'll definitely have to be reading this one as well. He does write SUCH the creepiest stuff!